Not sure what this piece depicts, but art is definitely in the eye of the beholder. This year’s weather has produced a bounty of fruit. 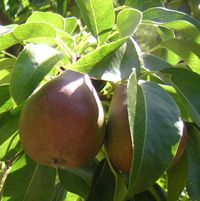 Most varieties are not yet ripe. If you’re in the orchard, it would be a great help if you could pick up a few apples and put them in the nearby garbage can. We’ll have a concerted effort for orchard cleanup on Saturday, 8/6, from 10AM to 2PM, as well as some summer pruning.